While your family explores the beaches during your Hatteras Island vacation, you might stumble across unusual structures sticking out of the sand or peeking out of the Atlantic Ocean. Large, old slabs of wood or chunks of partially submerged metal aren’t just beach debris, but are ancient remnants of shipwrecks, sometimes up to centuries old, that have been buried or deserted on the beach for generations. So on your Hatteras Island vacation, see if you can spot some of these unique reminders of the Outer Banks’ long and sometimes tumultuous maritime history. How To Find It: Head to the Wildlife Visitor Center and Nature Trail Information Center on NC Hwy 12, located 1/10 mile south of mile marker 31. Park at the visitor center and take the foot path over the dunes on the east side of the highway directly across from the parking lot. The boiler stack is visible in the water, though more is visible at low tide. The Story: A Federal transport during the Civil War, the steamship Oriental has been grounded in her present position since 1862. Local rumor has it that some of the area’s largest fish make their home in the Oriental’s rusty remains. 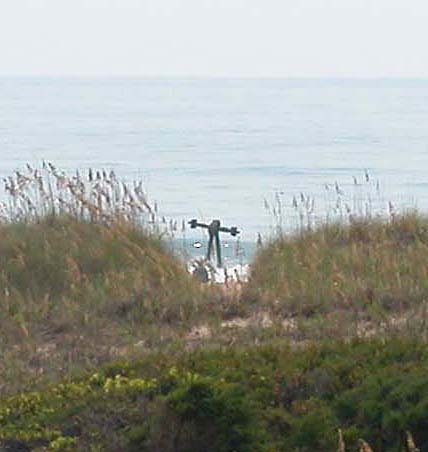 A wooden bow that was disconnected from the ship is located on the beach 1 mile north. How To Find It: Look for the parking area on the east side of NC Hwy 12, just south of the last building on the south end of Salvo, and 4/10 mile south of mile marker 43. The visible part of the wreck can be seen in the surf at high or low tide, but more is visible during low tide. The Story: Two local citizens provided information which led to this shipwreck. There was nothing about it in any Park Service or tourist bureau guides. It is thought to be an old paddle wheelship, and many people believe it be the Union ship called the Pocahontas, which wrecked while transporting troops in the Civil War. How To Find It: This wreck site is located directly on the beach, 75 ft. north of Ramp #27, which is near mile marker 47. There is also a parking area at the ramp. Parts can be covered with sand, depending on the wind. The Story: The Kohler was a very large ship, as can be seen by the thickness of the ribs in the sand. Driven ashore by a hurricane in 1933, the huge, four-masted schooner G.A. Kohler remained stranded on the beach in its original condition for 10 years. The ship was subsequently burned during World War II for her iron fittings, but the charred remnants of the Kohler remain. These shipwrecks may be some of the easiest to identify and most famous, but they certainly aren’t the only ones on Hatteras Island. Exposed shipwrecks, many of unknown origin, are constantly appearing on the beach with the shifting sands, or washing up in pieces after a storm. Keep your eyes open, and a sense of adventure, and you might just stumble upon a unique piece of Outer Banks history.